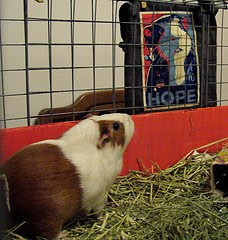 SnarkyDork: Hope. Pepper Haz It. So this cool friend of mine, in spite of being a weerdo, was over at Disney and snagged this t-shirt for me from the G-Force visual fx crew. I couldn't resist doing a little photo shoot. I wouldn't want anyone to think I'm losing my dorkiness. Pepper was very interested, while Pickle couldn't have cared less. 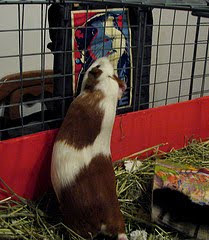 Maybe Darwin isn't her choice for leader of the guinea pigs. Cute shirt. Pepper's pretty cute too. Is she available?